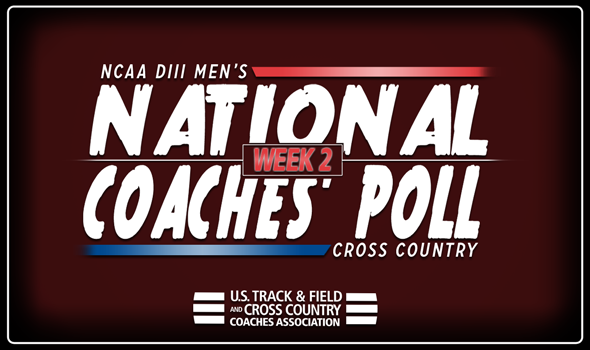 We have the first major change to the NCAA Division III Men’s Cross Country National Coaches’ Poll, as released Wednesday by the U.S. Track & Field and Cross Country Coaches Association (USTFCCCA). Washington (Mo.) jumped five spots from No. 7 to No. 2 – its highest ranking since it was also second in 2013 – after a masterclass performance at the Gil Dodds Invitational. The Bears put its entire scoring lineup in the top-6 as they thumped 16 other teams. Wash U, led by individual champion Brad Hodkinson, scored just 19 points to topple the ‘B’ team from top-ranked North Central (Ill.). Pomona-Pitzer joined the top-5 once again after falling out of it last week. The Sagehens thrived at the UCR Invitational this past weekend as finished third behind two NCAA Division I programs (nationally-ranked Southern Utah and unranked Utah Valley) and were the top non-NCAA DI team in the field. Andy Reischling led the way for Pomona-Pitzer in eighth place. Calvin improved its standing three spots from No. 12 to No. 9 – its best ranking since it was No. 6 in 2013 – following its outing at the Spartan Invitational hosted by Michigan State. A strong pack of runners – No. 12, No. 15 and No. 19 – helped the Knights finish fourth out of 25 teams and beat a number of NCAA DI and NCAA DII programs, not to mention those in NCAA DIII. St. Olaf went from the Land of the Unranked to No. 18 this week. The Oles traveled to the Augsburg Invitational this past weekend and finished a strong runner-up to previously No. 3 UW-La Crosse. Thomas Lerdall and William Anderson led the charge for St. Olaf as they finished sixth and eighth overall, respectively. This had been the longest the Oles had gone without being nationally ranked since the creation of the National Coaches’ Poll. Claremont-Mudd-Scripps vaulted eight spots from Week 1 to No. 20 in Week 2. The Stags finished eighth as a team at the UCR Invitational and were the second-best NCAA DIII team in the field. Miles Christensen proved better than his years as the freshmen led CMS as he was 29th overall in the field of 172 runners. Ithaca is in the National Coaches’ Poll for the first time in program history. The Bombers enter the poll at No. 33 after finishing runner-up to 13th-ranked SUNY Geneseo at the Yellowjacket Invitational this past weekend. Chris Tinti was the top finisher for Ithaca in sixth place. Be sure to check back throughout the season as we’ll see a lot more changes ahead of the 2018 NCAA Division III Cross Country Championships, set to take place November 17 in Oshkosh, Wisconsin.